Crispy prosciutto is always an adventure, as are pumpkins. They’re not just for jack-o-lanterns, but for cooking, baking and other fun festivities. In fact, fresh pumpkin offers plenty of vitamins and fiber to your plate, while captivating the senses with color and an unquestionable creamy texture. This dish, accompanied by sweet scallops and crispy prosciutto will undoubtedly whet your appetite, so it is ideal to serve prior to a meal. For those who love to dip, serve with some crispy bread or crackers. To make the velouté, saute the chopped onion in the olive oil. Add the pumpkin, potatoes and vegetable stock. Cook until done; then blend to a creamy consistency in a blender. Add salt to taste and keep hot; set aside. In a small frying pan, caramelize the sugar in butter; add the scallops and saute for 30 seconds on each side. In a separate small frying pan, fry 4 slices of Prosciutto di Parma until crispy. 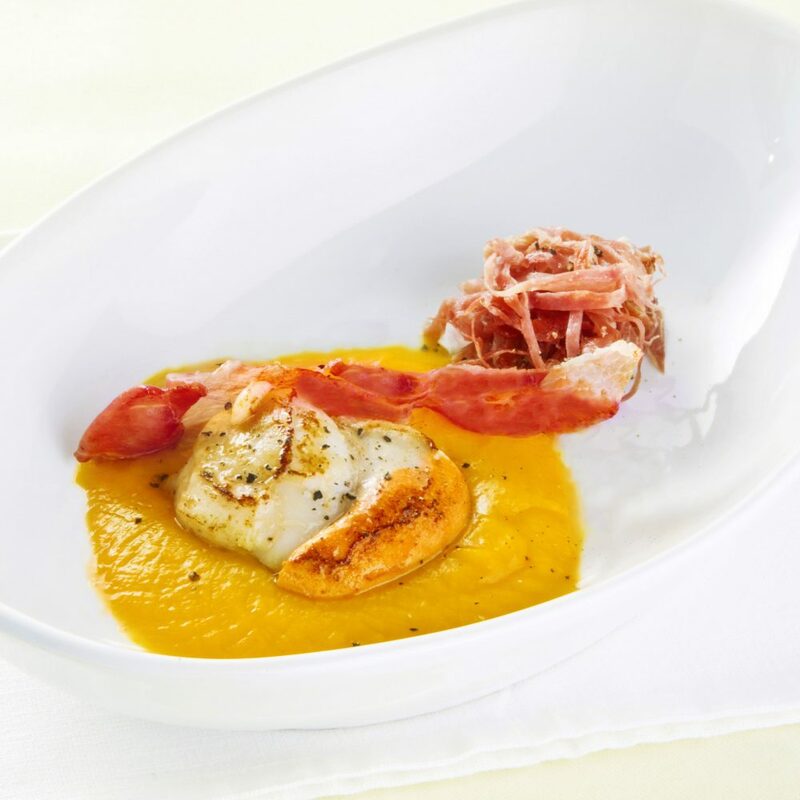 To plate, in individual shallow bowls top the velouté sauce with the caramelized scallops and slices of crisped Prosciutto di Parma. Finish with a julienne strip of Prosciutto di Parma and freshly ground black pepper, to taste.